Number 311 came swooshing out of the park. I could have watched them finish all day. But I had a yarn tour to guide. Bye bye 311! Congrats! 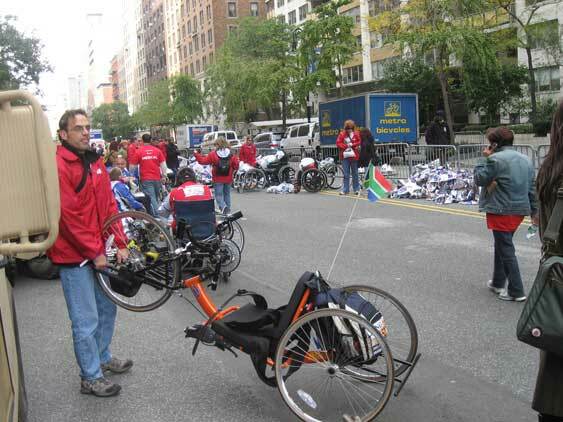 Then I walked up Eighth Avenue through throngs of catatonic/triumphant marathon finishers swaddled in mylar, and saw another kind of wheelchair being put to excellent use. 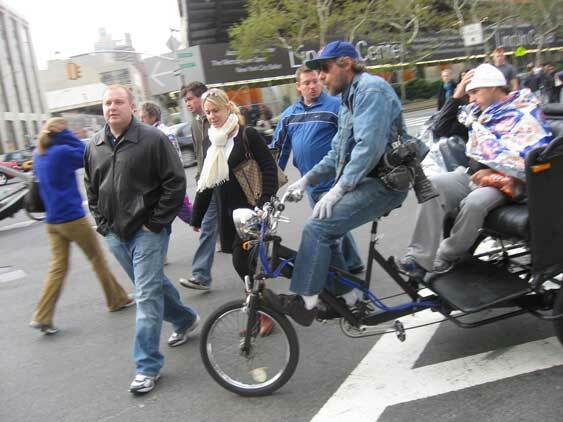 I knew that New York’s pedicab drivers were an entrepreneurial lot, but the number of pedicabs on the street, loaded with tuckered-out runners, was staggering. Like sedan chairs in a Cecil B deMille movie. 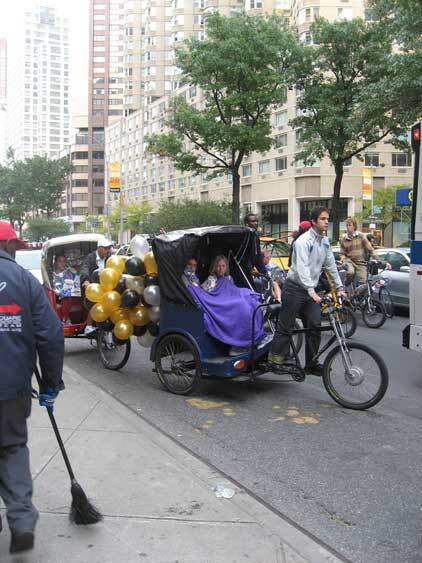 To the victor go the pedicabs. 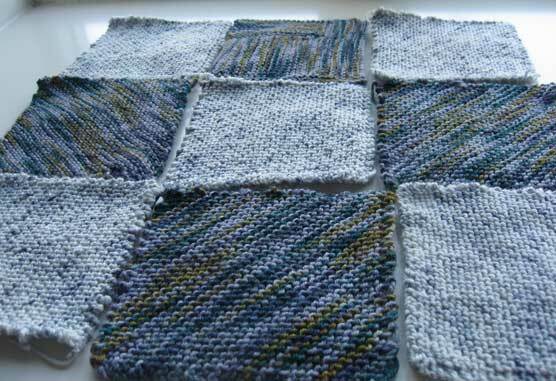 All of which got me even more fired up with my square-knitting for Oliver’s blanket, which is being raffled to raise funds for…a new wheelchair. The light squares are in Koigu, the dark squares are the new Regia sock yarn colored by Kaffe Fassett. These are really fun to knit. I get a 4-inch square very reliably by casting on 3 stitches, increasing in the first stitch of every row until the “legs” of the triangle are 4 inches long (at my gauge, this is when I reach 41 stitches), and then decreasing in the first stitch of every row until I’m back to 3 stitches again, and bind off. In other news, we have a dog. Kidding! We wish we could have a dog, but we can’t. We rejoice because good friends in our building are crazy enough to take on a puppy just as their boys are getting ready to leave the nest. Four floors down from us, college applications and potty training are occurring simultaneously. This insane situation creates a nice dogsitting/walking job opportunity for dog-crazy Carrie. Meet Artie. Artie is a girl. (Full name Artemis, after the goddess of the hunt, currently the hunt for the wee-wee pad.) We heart Artie. That’s it for me today. My next post: a contest. Stay tuned. I love the colours of the squares. 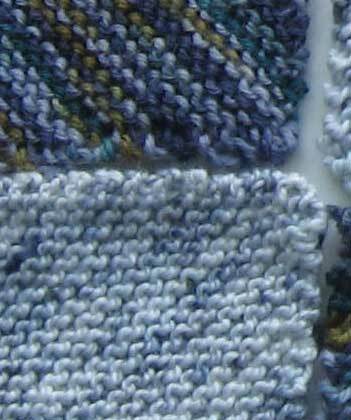 Garter stitch is so wonderfully soothing and interesting in a variegated yarn – are you going to simply seam it or is there an interesting joining technique in the works? My brother had a gorgeous black lab he named Artemis. After that were Arwen and Strider. Then he got married and his wife brought along Magick. My sister’s dog is George Michael Fernando James. Hey, why aren’t you running the marathon? Aw, I want an Artie! Goldens are the BEST! We had one. She was so goofy and loving. She couldn’t get close enough, often if I sat on the ground she would sit in my lap (and this as a 45-pound dog). I think a neighbor dog may be the perfect pet. Sort of like the grandchildren of the pet world — all the cuteness, but you can send ’em home to someone else. Our dog is (Hairy) Potter – a Lowchen, which would be a good city breed, I think. are you SURE there is not a dog in your future? Artemis needs her brother Apollo to pal around with. You know, families united by their dogs who were PUPPIES together. They shared pee-pads! and fought over bones! 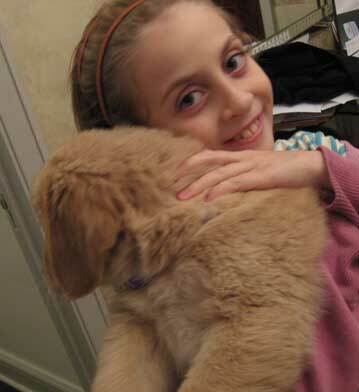 Your daughter does look awfully happy with her furry companion…. I heart Artie, too, but even more do I heart Maya, my own puppy (named after Maya Angelou, in keeping with our tradition to name our dogs after poets — Berry is named after Wendell Berry). Maya is extremely cute and totally clueless about where the pooping zone is. To her mind, it’s anywhere. There’s something about puppies that can make a mom forget that her babies are going off to school. I *heart* Artie too! the kaffe squares are really nice. I’ve been using the handpainted ones for squares but not the stripey-patterns ones, but now that I see how they look, I’ll have a dig in the left-overs and see what I can muster up. Our military news here in Korea.. featured some of the injured military troops in the race w/ their wheelchairs.. very inspiring. That was on the military tv channel- it’s our American tv channel. Inspiring story. I love the blues of the blankie-very soothing. Squeeee! The puppy is cute! As for the marathon, I only run if chased, so I have no clue about the traditions therein. Aw! I heart Artie, too! 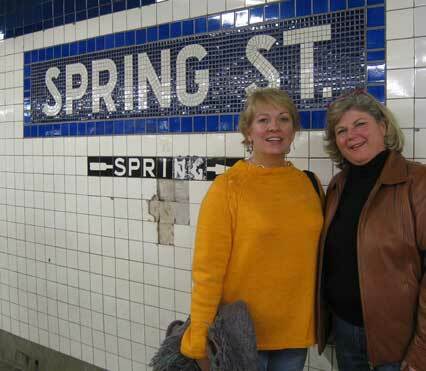 This was the 2nd year DD and I visited NYC on Marathon Day – last year to give hugs and encouragement to friends who participated, this year to visit DS, recently relocated there. We had dim sum, then wended our way up West Ave to the Cloisters. Fabulous! Neighbors/friends having dogs is like having grandkids, you get to play with them on your own terms and when you’ve had enough you give them back. I haven’t seen so cute a puppy since our long-haired dachshund Rudy was a pup. . . and he’s grown up to be a total glamour-puss. OH, the puppy post. Always a winner. 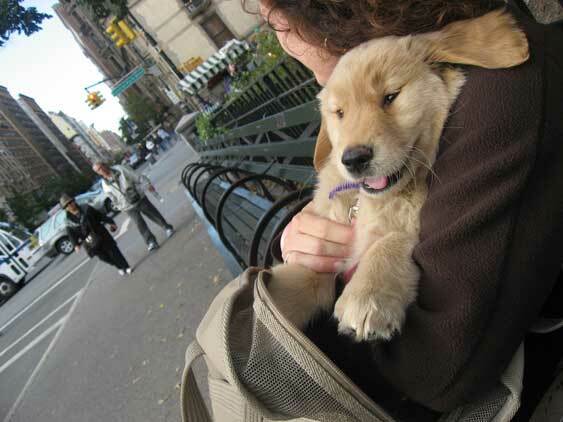 Funny, I dreamt that a new golden pup was brought over by my breeder. Very similar to Art. I was probably anticipating this post. Excitement in the city! Artie is a sweety, how nice. Thanks for the info on the squares. I have some leftover wool that was looking for a purpose. hello, artie:: i’d like to carrie you around, too. such paws!! Aaawwww, what a cutie! Our Golden is just over 4 months now and already too big to carry. You know, if you got your own you could spin his/her fur into really beautiful yarn….just sayin’! I’ve done my share of dog walking when feeling doggie deprived. I may take it up again sometime when I have more time. Go Carrie for helping your neighbors! I highly recommend volunteer dog walking for anyone who can’t have a dog in the home. That second picture is soooooooooooo adorable. I love the ear on the shoulder. That dog is SO cute! I want to take her home. 🙂 You’re so lucky to be able to watch her grow up…cause you know that will happen very quickly. Aw, I wish my two dogs were still pups sometimes. 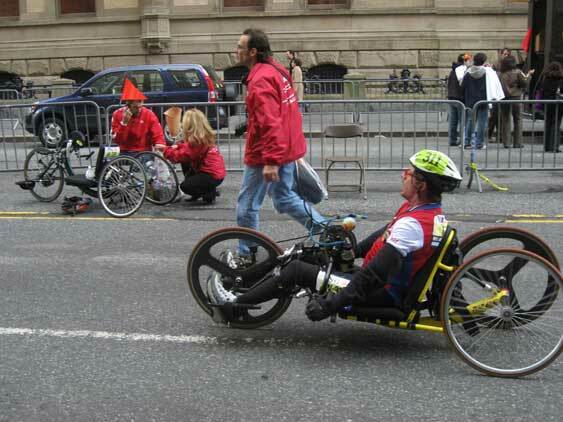 Hooray for the wheelchair racers! 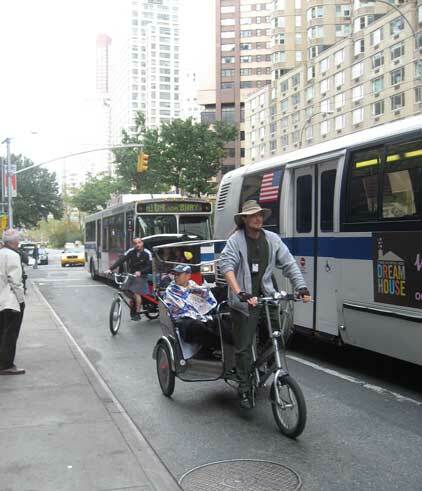 Kurt Fearnley, the Australian who won the wheelchair section of the NY marathon (again), comes from my town. He is a damn nice guy. Artie is just gorgeous – but she is going to have some size on her when she grows into those paws. Carrie will have her work cut out for her keeping that one exercised! Woke up–waiting for the coffee–checked MDK. Wait a minute is that GUSTY?!?!?! Naw, can’t be someone I know that knows Kay–THE Kay of MDK–small world. Thanks for posting the pic, made my day. Delurking just long enough to say: I WANT ARTIE. Better late than neva, huh! Well, The Blanket is going to be scrumptious. Can’t go wrong with those calming blues and grays. And the cause is just. Artie . . . that is one delicious-looking piece of fur, ah pup. Yep, your life has changed in ways you can’t imagine, and Artie isn’t even a resident of your house! One look in Artie’s eyes and I can see the fun just bursting to get out. Hold on!! !